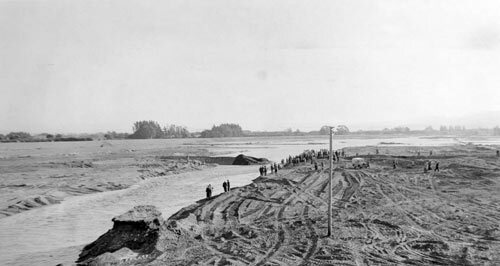 Flood-control efforts in the Wairau River valley culminated with the opening of the Wairau diversion on 30 April 1963. The diversion established a course for the Wairau River which ran from State Highway 1 at Tuamarina directly cross-country to Cloudy Bay. The usual course of the river meandered for some kilometres south-east before reaching Cloudy Bay at Wairau Bar, and was unsuited to handling surges of water.